It’s that time of year again when we’re all putting our lists together and the question on everybody’s lips seems to be ‘what would you like for Christmas?’ but if I’m completely honest I’m finding it more and more difficult each year to think of what I want! Must be a sign that I’m getting older and growing out of the whole ‘I need this’ or ‘I have to have that’ phase. 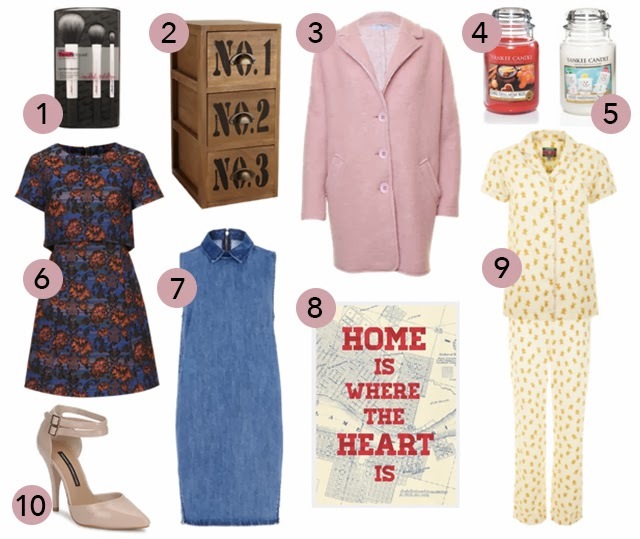 This meant that even putting this together was a bit of a struggle, but these are all things I love and things that would appear on a regular wishlist even if it wasn’t Christmas time! Also, please don’t take this as me being spoilt or greedy. I don’t expect to get all this at all. It is only a wish list after all! 1. As most of you know and will have seen in various posts, I’m a huge fan of Real Techniques, so this cute little gift set of their limited edition duo fibre brushes is the perfect gift for me. I’d use the big one for powder, the medium one for my foundations or BB cream, and the small for blending in concealer. Such a great set for achieving a flawless base! 2. This is something I spied in Matalan a few weeks back and loved. Dan and I are looking for our own place and will (fingers crossed) be moving out around February/March time, so we’ve asked pretty much everyone for vouchers (boring I know) so we can pick up some house bits. Something like this would be perfect for all those bits and bobs in the living room or the kitchen. 3. OMG. This is top of my list this year! I’m all over the pink coat trend, but being so pale I’ve found it hard to find the right shade. This dusky shade would look lovely against my blonde hair and the shape is the perfect oversized boyfriend fit. 4/5. I’m obsessed with Yankee candles, but have never owned any of their Christmas scents before, so these two are definitely on my list! There’s nothing better than lighting a Christmassy candle on Christmas Eve and relaxing with the family for some yummy food and a tipple! 6. This dress was jumping off the screen at me when I was checking out Topshop’s new stock last night. I love everything about it – the print, the fit and the gorgeous little crop top detail. 7. Again, another dress that I spotted whilst window shopping. I love denim dresses but have never seen one like this before. I’d wear this over a long sleeved jersey tee and put on some chunky black heeled boots, and finish it off with a statement necklace tucked under the collar. Beaut! 8. Back to things for the house! I’m a sucker for fun artwork and prints, and this one would be the perfect addition to a new home. I really like the colours and could see this looking lovely propped up on the mantlepiece! 9. Christmas pyjamas are an absolute MUST for me. Technically I like to get a new pair to wear on Christmas eve, but I guess I could wait one night and have these on the big day itself. Covered in tiny little gingerbread, these are so adorable and I really like the traditional pyjama top shape. 10. Finally, something that I’m sure will be on most girls lists is a new pair of gorgeous heels. I’m after something simple and understated that I could wear with skinny jeans and a chunky jumper for work, but something that can be dressed up too for nights out. I spotted these French Connection heels and it was love at first sight! I love the pointed toes and the ankle strap. These would look amazing teamed with some tapered trousers and a simple baggy tee. Want! So that’s my Christmas wish list. What are you asking for this year? "IN LOVE WITH FASHION – A GIVEAWAY"
Love the coat and yankee candles!